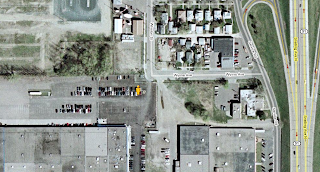 Gordon's Notes: Google Street View in Saint Paul, Minnesota? Google Street View in Saint Paul, Minnesota? Google Street View (more here) is Google's amazing and controversial photographic reconstruction of street level details. It's enabled for San Francisco and a few select other cities. My traffic map today has a 'street view' button. Clicking it merely toggles an icon of a standing biped, currently located in an obscure parking lot by an unremarkable intersection about one mile north of my home in Saint Paul. The icon, which I recognize from other Street Views, is inactive, though s/he does have a context menu (center, zoom, etc). So is it a glitch, or are we really going to see Street View in the twin cities? Who the heck picked that spot and why?